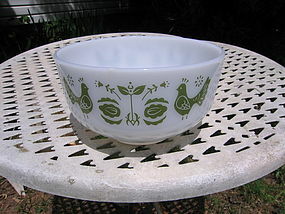 I've never been able to find an official name for this fairly uncommon Federal Glass pattern, however, it looks much like a Pennsylvania Dutch motif. This is the 2 1/2 quart size of a mixing bowl set. There is little if any sign of use, but does have the normal manufacturing lines, found in most of the Federal, Fire King and Glasbake milk glass of the era. It was manufactured before the microwave time period. Other pieces of the original set are available and priced individually. I need your zip code to calculate the postage.